Observe common objects using multiple senses. Gather items made from different types of materials cloth, plastic, wood, metal and glass as examples. Also, gather different wooden items picture frame, rolling pin, spoon, hanger, box, pencil, and so on. Practice with identifying and using the five senses seeing, hearing, touching, tasting and smelling. Say, “We know that all matter, everything around us, is made from some kind of material." Display some of the items you have gathered that are made of different materials. Then hold one item up and ask a student to tell the class what material it is. Do this two or three times with different items. Then use the bags you have prepared and ask a few students to take turns reaching into the bag to guess the material from which the item is made. Can the student describe how they know the answer? Is it soft? Sticky? Shiny? Is it heavy? Thick? Smooth? Can you bend it? Is it stretchy? Is it hard? Squashy? Cold? Then ask each student to find a partner that has an item that has one thing in common with his item. Maybe the color or shape is the same. Maybe they are both smooth. Maybe the items are used for the same thing. Not only will the students become more observant but they will also get practice communicating their discoveries. Want even more ideas? Check out Let’s Learn About Wood! 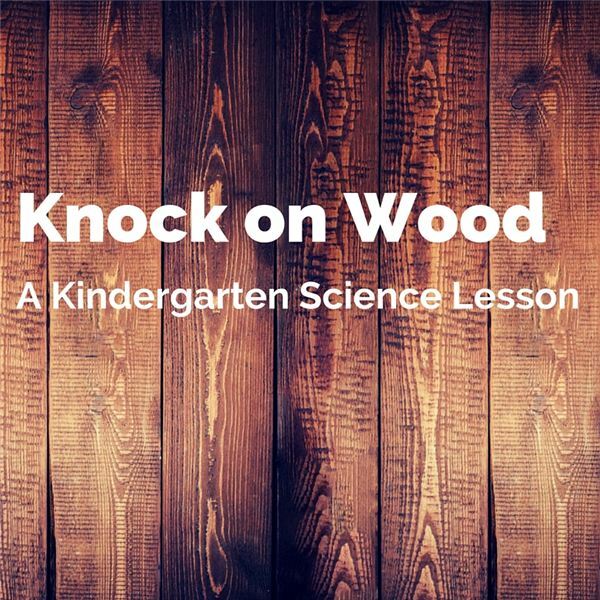 A Science Lesson Plan for Kindergarten on Bright Hub. Llewellyn, Claire. Wood. Franklin Watts, 2002. Ditchfield, Christin. Wood A True Book. Children’s Press, 2002.